There are many legends in the G.I. Joe fandom about how a particular character came about or why one character has the color scheme that he or she does. It’s the stuff of rumor but occasionally there is a grain of truth behind that rumor. For instance, back in the bygone days of G.I. 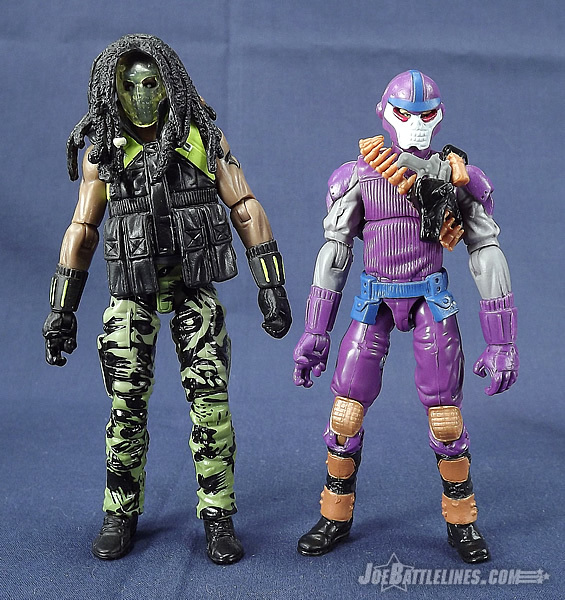 Joe vs. Cobra (sometimes referred to as “generation 2” of the RAH era), Hasbro was fond of releasing classic molds from the 80’s and 90’s in different color schemes. One such instance of this was a reissue of the Range Viper produced almost entirely in purple hues. The tale, as recounted to me at a Joe Con by a then-member of the Hasbro team, was that this particular figure was because Mattel has released a brand new line of Masters of the Universe figures. In an attempt to cash in on the potential popularity of Skeletor, Skullbuster was born. It’s an interesting tale that sheds insight into what transpires in the minds of brand managers and marketing teams. Regardless, Skullbuster sat forgotten with just a solitary figure to his name—until now. Is this new release worth your hard-earned cash? Read on and find out not one but two Joe fan’s opinions! 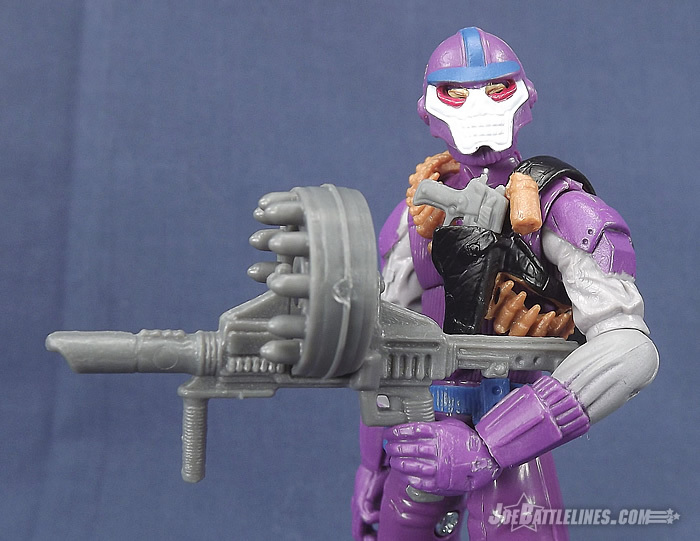 Skullbuster is intended to be the commander of the Range Vipers and, as such, takes much of his inspiration from that figure. 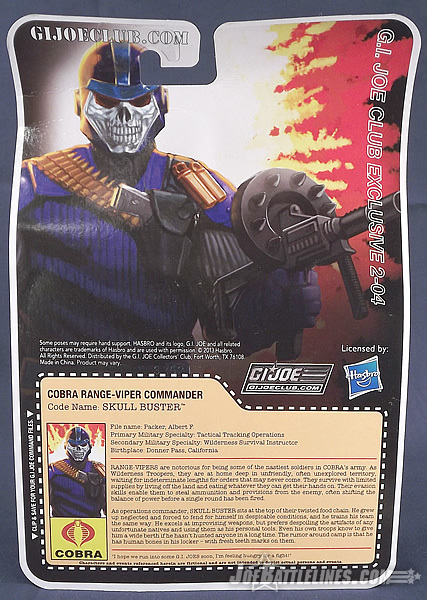 In fact, practically the entire figure comes from the Defense of Cobra Island release of the Cobra Range Viper v4. 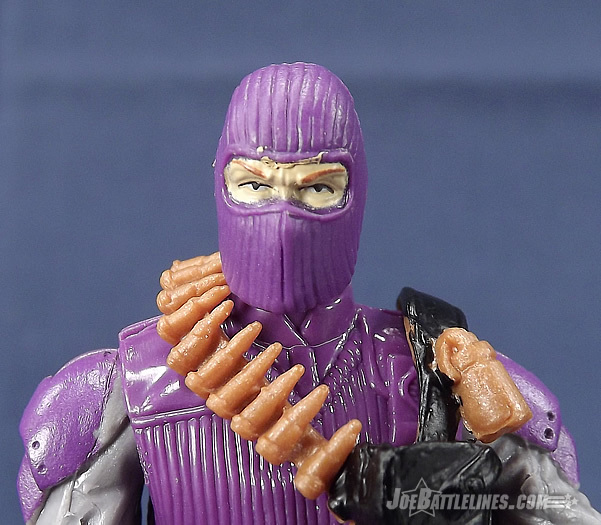 The head, upper arms, upper and lower torso, legs, and feet all appear to be repurposed to produce the Range Viper squad leader. It’s a construction that makes a great deal of sense up to this point. 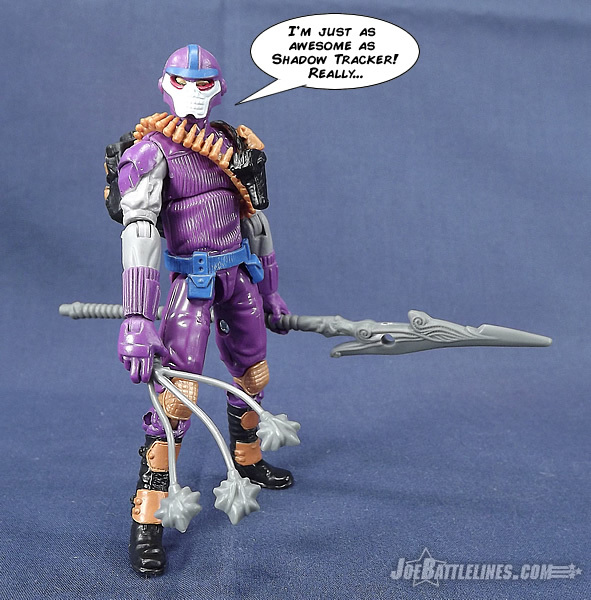 However, to give ole Skull Head something to help him stand out the folks at the Collector’s Club opted instead to use the lower arms and hands of another Cobra wilderness expert—the mysterious Shadow Tracker from the 30thanniversary line! (A figure that has yet to be reviewed here at JBL. Stupid self-imposed hiatus!) The irony is that Shadow Tracker is a significantly taller figure than Skull Buster and the result is that good ole Skull Face has arms that might be better suited to someone a few rungs further down on the evolutionary ladder. In fact, he’s got arms that practically reach his knees. Maybe he’s getting in touch with his “animal side” or maybe he’s a V-Troop but the arms are a huge standout on the figure… and not in a good way. Am I making too much of this Chris? No Professor Meyer, you are not making too much of this. In this day and age, it is a glaring sin why these figures aren’t the best figures they can be, especially at the already premium pricing in bulk, but also the evermore inflated prince for singles . Skullbuster is an already damaged figure as I’ll discuss below, but he is utterly ruined by the ridiculously long chimp arms, plus a hand that is only good for “holding” a imaginary bow string. I don’t know who actually makes the part selections on these figures, whether it’s the Club or Hasbro. I also don’t know if they have free rein on all modern parts, or if there is a limited selection on parts, but whoever put this figure together had to have noticed the glaring disproportion of the arms. That was bad enough because it speaks volumes when fans can create better customs of Skullbuster who are not industry designers. But what makes this all the worse, is the mentality that whoever designed this figures just looked at it and said “That’s good enough.” No it’s not. If this was some $11.99 Target exclusive like the prior Range-Viper, fine, I can understand going cheap and thoughtless. But for a $37.00 figure I expect all the bells and whistles, and it to look aesthetically attractive. Not so with the Skullbuster. In fact, given his ape-like appearance and freakish proportions, the Club should have simply given him a gold leotard and packaged him as a new Intruder, just billed as a “Not So Strong Men From A Different World”, because that would at least explain his devolution. A final gripe stemming from proportion is Skulbuster's subpar card art. Like the figure, the art suffers from severe proportion issues that makes him almost look as if he was dwarfish. Seriously, look at his legs! Who the heck approved that?! It was almost as if the portrait was a quick, desperate attempt by the artist to fit the entire body "on screen" with no regard to how it would flow, and no thought to creating something realistically or aesthetically correct. Again I have to go back to the pricing on these figures. If we're paying premium pricing, then I expect a premium artist to do the cards, not the in-house go-to guy or the person they can pull off deviantART who is willing to work at minimum scale---or less. As it stands, this art is unacceptable. 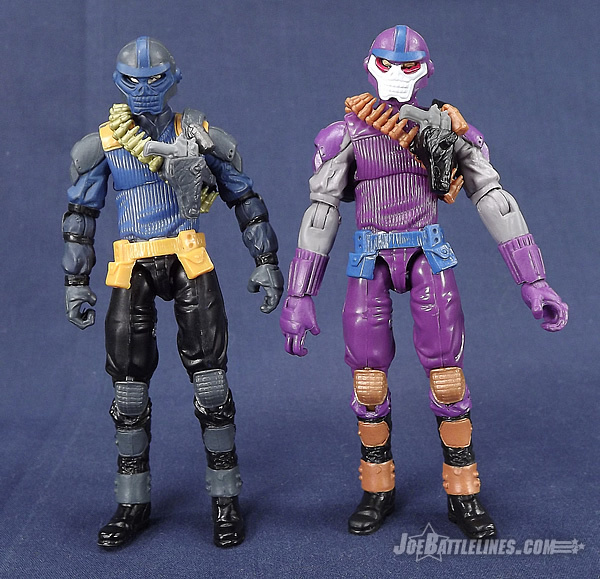 As was mentioned before, Skullbuster recycles most of the parts from the last release of the Range Viper—right down to the balaclava and the DTC Range Viper mask. It’s a solid attempt to recreate the original Range Viper design and, for the most part, it works. However, with something like the G.I. 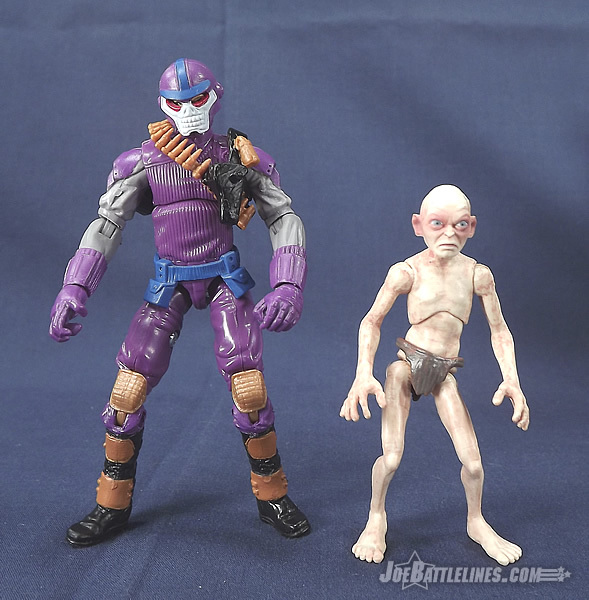 Joe Collector’s Club Figure Subscription Service I want something a bit more. This would have been a great opportunity to either introduce a brand-new head sculpt for Skullbuster to give him more character or even repurpose some existing tooling from the Hasbro library. The GIJCC was able to do so with reasonable success with Dice in the first series of FSS so why not do so again? 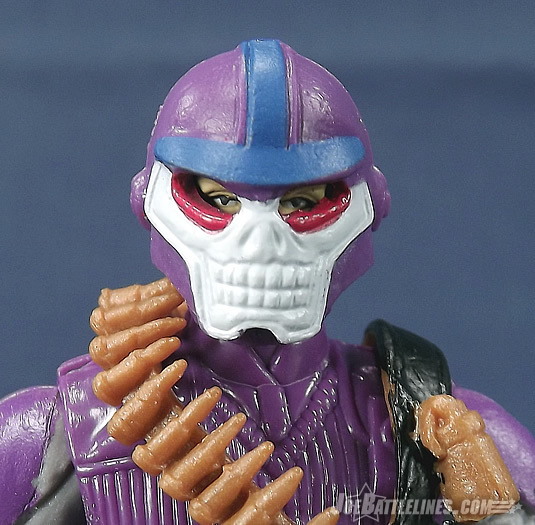 Even a plain head like that of the 25th Anniversary Serpentor could have gone a long way toward making Skullbuster more of a unique character in the eyes of many Joe fans as opposed to an ape-limbed Range Viper repaint. I’ll probably catch flak for this dismissive attitude from some corners of the fandom but I can’t see it any other way. For a premium price I’d expect this figure to be bit a bit special and Skullbuster is lacking that bit of uniqueness to push him over the top. What say you, Mr. Werecat? The primary problem with Skullbuster besides his proportions is his construction. With an interesting feeding habit; coupled with the combined skills of Bear Grylls, Les Stroud, and my dad, you’d expect the leader of the Range-Vipers to be imposing and tough. However, Skullbuster is not. He’s essentially a poor man’s Shadow Tracker, but just sold at prices the poor man can’t afford. What could have been a cool figure is essentially ruined by the chimp arms, plus a scrawny stature with thin arms, a very short torso, and short legs. The idea behind Skullbuster was fine, but this nitch was inadvertently filled in by Shadow Tracker; who is by far a more impressive figure. On the flip side, Skullbuster looks too weak and too small, especially when compared to Hasbro’s jump to 4” over 3 3/4”. Why a better body (taller, more muscular) wasn’t chosen boggles my mind. Well, no it doesn’t. I think we all know why the base parts were chosen (sans the lower arms), but it doesn’t help this figure’s case of looking like a child compared to taller figures. Even the standard Range-Vipers look childish. We are then treated to an absolutely ridiculous deco. Bright purple? For a night out at the discoteque? Absolutely! In the wilds? Get real. Yeah, I get it. 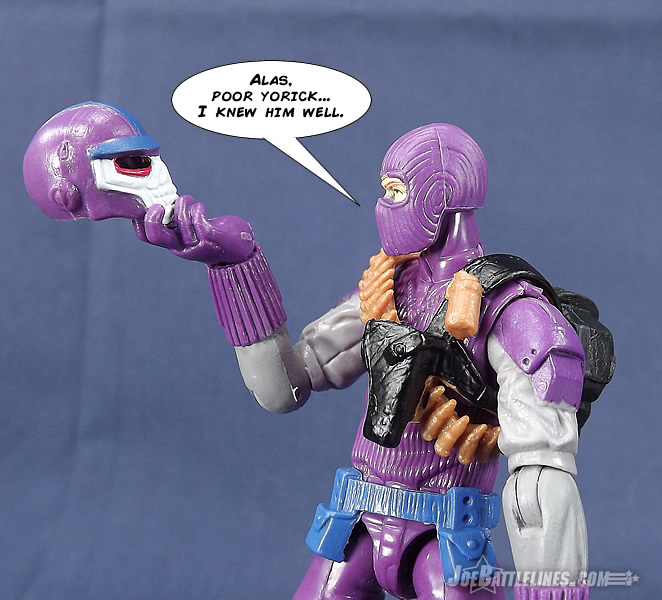 “Skullbuster was purple, so we gotta do it that way.” That mentality of the FSS not updating characters in lieu of maintaining a tired and outdated 25th homage style is a flawed logic. Throw that mentality out with the “Dead is dead” rule. A far more imposing and interesting Skullbuster would have been an update that had a powerful body and tactical colors. 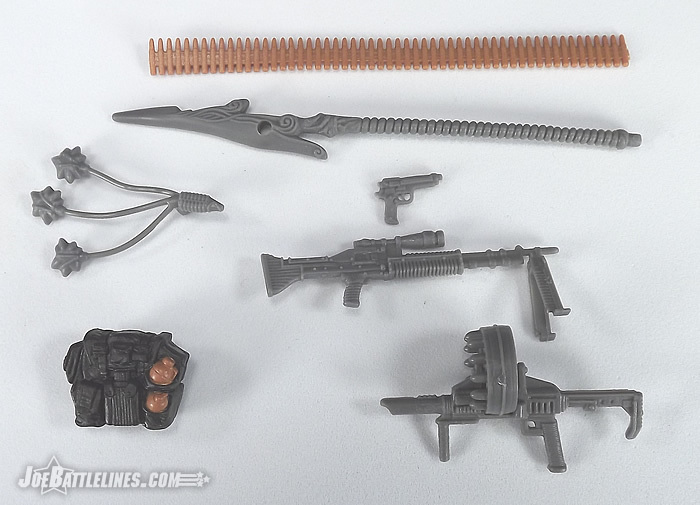 When it comes to Skullbuster’s kit, it’s an odd bag of goodies. 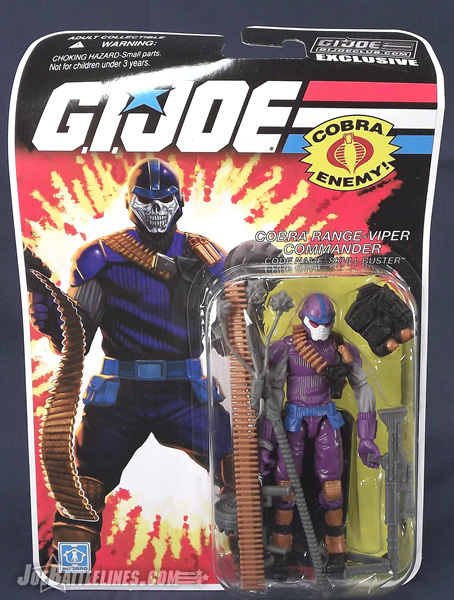 He comes equipped with a heavy machine gun and the same grenade launcher that was included in the Defense of Cobra Range Viper, which makes sense for a squad leader. 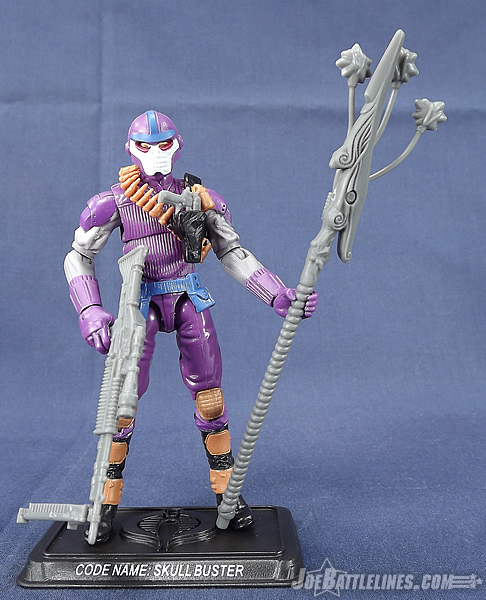 However, it seems that Shadow Tracker’s influence isn’t just limited to the figure’s forearms as Skullbuster also includes the 30thanniversary tracker’s spear and flail weapon. The result is an almost schizophrenic compliment of weapons and accessories that just ultimately don’t gel at all. What’s worse, the modern weapons such as his pistol, machine gun, and grenade launcher don’t really fit well in the character’s right hand. Now, you might be thinking to yourself “what’s wrong with him using his left hand to hold them?” Doing so causes the gear to run afoul of the shoulder holster that hangs under the figure’s left shoulder resulting in a lot of unnecessary clutter. Again, I might be a tad too picky on this but for something like the FSS I expect a bit more. What’s your take on this Dr. Chung? As always the question that any good review should answer is this: is this figure worth purchasing? I have a hard time with this one because I really wanted to like Skullbuster. However there are a few things that cause me to stop short of endorsing this one. First, there’s the overly-long arms that are immediately noticeable in the packaging. Secondly, there’s the fact that his gear just doesn’t fit well in his hands. Thirdly, there’s the bland nature of the head sculpt. 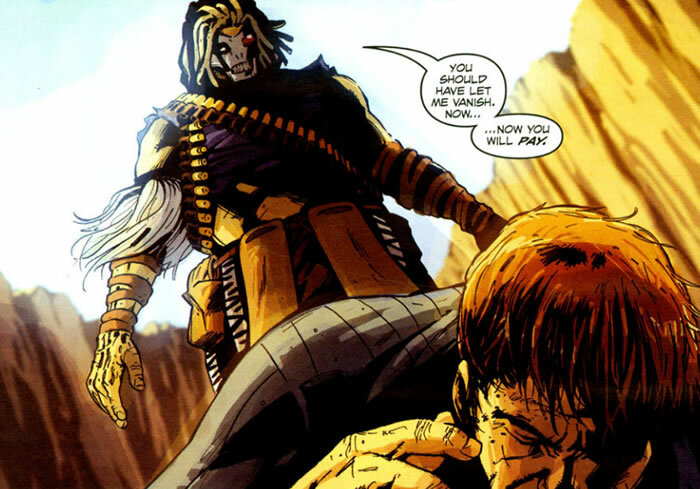 In his last major comic book appearance in G.I. 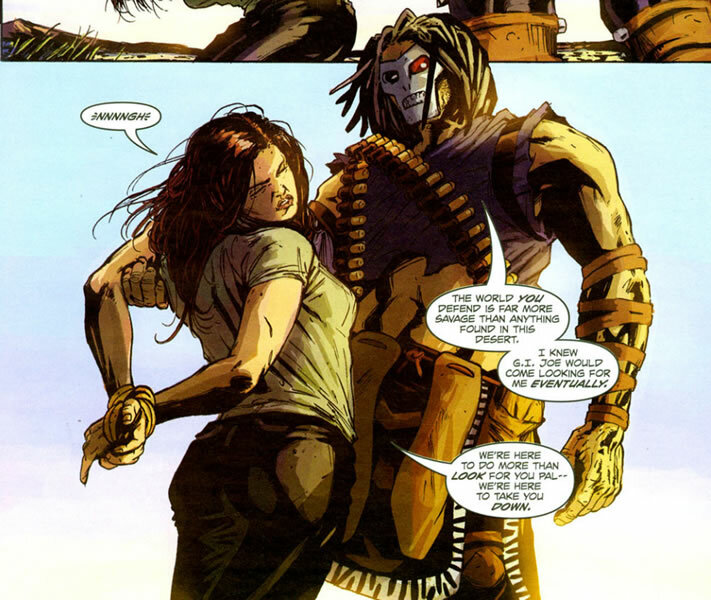 Joe: America’s Elite #27 Skullbuster was portrayed as having “gone native” on the northern coast of Africa. The result was a character design that was an interesting fusion between a standard Range Viper and the then-forthcoming Shadow Tracker. It was a design that had character—and personality. It showed the type of mental instability that the Club attempted to portray in the file card text. (Spoilers: He’s a cannibal.) Ultimately, however, Skullbuster just falls short in many respects. I know that completionists are going to buy him but I’d suggest the casual fan pass on this one. The bottom line: Parts disparities and a lack of “design personality” make this figure purely optional for most fans.